Sorrento Condos: KICK BACK AND RELAX in this FULLY FURNISHED previous MODEL! This beautiful end unit Sorrento home boasts upgrades galore! Walk up your newly carpeted stairs into your newly carpeted bedroom(s) or wander through the bright and warm naturally lit and inviting kitchen. The rich upgraded 42" dark wood cabinetry, stainless steel appliances, granite countertops, tiled back-splash, and pristine crown molding throughout highlight the designer like decor that continues through each room. Three types of flooring exude elegance; diagonal tile, hardwood, carpet, you name it; this home has it all! Say good-bye to builder beige and say hello to your new designer like home! Sorrento Condos: Look at these amazing views! Spacious home with 3 bedrooms plus an enclosed den that can be used as an office, playroom, or even an extra bedroom. If you like a bright, sunny home, this one is for you! Enjoy beautiful sunrises and sunsets from your screened lanai overlooking the lake. Home is located on a quiet cul-de-sac with tropical, lush landscaping. Enjoy peace of mind with hurricane resistant windows throughout with custom window treatments. Home is seldomly used and looks brand new. You will love all the amenities Sorrento has to offer such as a resort pool with waterfall, clubhouse, fitness center, bocce ball, and cabana. Located minutes from Barefoot Beach. Convenient to I75 and brand new Bonita Springs high school. Close to the airport, shopping and dining. Come and see today! Sorrento Condos: Like NEW Pristine Carriage Home Capri Model in Sorrento. Two bedroom plus Den with (Dark Wood Cabinets with Granite counter tops are an Upgrade....a + that makes this home pop and stand out on its own)... Attached one car garage plus driveway for parking, screened private Lanai for your quiet times!!! This warm community is waiting for you. One of the best locations in the community towards the end of the cul de sac. This quaint complex is located conveniently just minutes from 75/Ft Myers International Airport. Close by Barefoot Beach has been voted the top rated beach in Florida, escape for long walks, sunsets or just getting away for family beach day, entrance to the park is free after 6pm. Multiple types of shopping from Mirmar large open air discount Mall, an experience in itself or fine International shopping at Waterside in Naples or Mercato which offers open air shopping, fine dining or just to enjoy your favorite Movie along with your favorite beverage. The condo location is walking distance to the large patio pool with a nicely furnished, gym and Bocce Ball Court. This area of SW Florida is a class of its own...This opportunity is waiting for you Today! Sorrento Condos: Beautiful 3 bedroom plus a closed den, 2 bath, 1 car garage Coach Home. Spacious kitchen with granite countertops and stainless steel appliances. Tile flooring and carpet in the bedrooms. Screened in lanai. 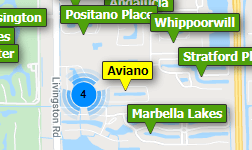 Home is located near I-75, beaches, shopping, restaurants, coconut point mall, FGCU, airport, etc. Sorrento Condos: Looking for a lake view? Enjoy your morning cup of coffee on your private lanai overlooking the lake & fountain. This ground floor end unit has an easter rear exposure with several southern facing windows off the living area offering plenty of natural light. The Capri floor plan offers a split bedroom layout w/ 2 bedrooms+den, 2 baths, & an attached 1 car garage. This building is located on a cul-de-sac w/ a longer driveway for extra parking. IMPACT GLASS WINDOWS - no need for hurricane shutters! Other features include: tile on the diagonal (in living, den & wet areas), 42" wood cabinets w/ under cabinet lighting, stainless steel appliances, & crown molding (in living area, den, & master). A separate storage closet is great for beach chairs & seasonal items. Sorrento is a maintenance-free gated condo community. The condo fees include cable & internet. Community amenities are a clubhouse for entertaining, exercise room, bocce ball, & resort-style pool with cascading waterfall. Just a short drive to the areas finest gulf beaches & the RSWl airport. The upcoming Logan Blvd extension to Bonita Beach Rd will allow you to be in Naples in minutes! Property can be sold turnkey furnished. Sorrento Condos: Look no further. This gently used Capri model is in immaculate condition and the owner spared no expense on upgrades! This 2 bedroom plus den condo has gorgeous 18" porcelain tile that is laid on the diagonal, crown molding, high-quality ceiling fans throughout and granite counter-tops in the kitchen & bathrooms. There are plantation shutters on all the hurricane impact windows and Hunter Douglas vertiglide coverings on patio and entry doors. Watch the beautiful sunsets which silhouette a stand of stately palms from the west facing lanai while surrounded by a well-manicured landscaped yard. Can you see yourself here yet? Sorrento is a quaint, maintenance free, gated community with a resort-style pool, fitness center, and clubhouse. The Maintenance fee includes high-speed internet and three HD TV's adding to the value of this community. Bonita's finest golf courses, shopping, dining, beaches, and access to I-75 are just minutes away! Sorrento Condos: Terrific Location and value!!!!!! End unit 3 beds + den / 2 bath home, with bright an open floor plan and split bedroom! At Sorrento you’ll enjoy a maintenance free lifestyle and resort style amenities include pool with water feature, bocce court, fitness and social room ! Sorrento is a gated community located in Bonita Springs, approximately 2 miles East of I-75 on Bonita Beach Road. Just minutes to fine dinning and world class beaches!! GREAT VALUE!!! Schedule your private showing today!!!! Sorrento Condos: Located in a gorgeous gated community this serene 2nd-floor unit with 3 bedrooms, a den and 2 full baths is waiting for you!! The large great room floor plan is highly ideal for entertaining. You can enjoy your early morning coffee on your private screened in lanai or even in your great room. The master bath features dual sinks, a walk-in shower and a walk-in closet. The owner has also put brand new carpet and paint throughout! You and your home are protected with impact glass windows throughout so no need for hurricane shutters! New Hunter Douglas fans were just installed April 2019 in the master bedroom, great room and den. Sorrento is a quaint, gated community located in beautiful Bonita Springs, Florida with only 152 neighboring units. Amenities include a clubhouse wonderful for entertaining, an exercise room, bocce ball and a resort-style pool with a cascading waterfall great for kids; also great for lazy afternoons. Relax in the sun or for the exercise enthusiast head to the gym for a great work out. The Sorrento community is just a short drive to the finest Gulf beaches, SWFL International Airport and I-75. This unit is priced to sell; Come check it out! Need professional assistance selling your property at Sorrento Bonita Springs? Find out how an Area Specialist can help to generate more property exposure in order to get the most money for your investment in the least amount of time.